Bethesda Mennonite Church, Broadway, Virginia, 2012. Photo by Elwood Yoder; used with permission. 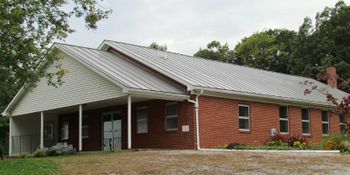 Bethesda Mennonite Church is located in Broadway, Virginia. It was founded in 1974 and is a member of the Southeastern Mennonite Conference. In 2014 it was served by Bishop Nathan Good, Minister Jonathan Good, and Deacon Arthur Martin. The church had a membership of 41. Mennonite Church Directory 2014. Harrisonburg, VA: Christian Light Publications, Inc., 2014: 126. Thiessen, Richard D. "Bethesda Mennonite Church (Broadway, Virginia, USA)." Global Anabaptist Mennonite Encyclopedia Online. April 2014. Web. 25 Apr 2019. http://gameo.org/index.php?title=Bethesda_Mennonite_Church_(Broadway,_Virginia,_USA)&oldid=117414. Thiessen, Richard D. (April 2014). Bethesda Mennonite Church (Broadway, Virginia, USA). Global Anabaptist Mennonite Encyclopedia Online. Retrieved 25 April 2019, from http://gameo.org/index.php?title=Bethesda_Mennonite_Church_(Broadway,_Virginia,_USA)&oldid=117414. This page was last modified on 6 April 2014, at 07:04.